LEED precertified at Gold Level! 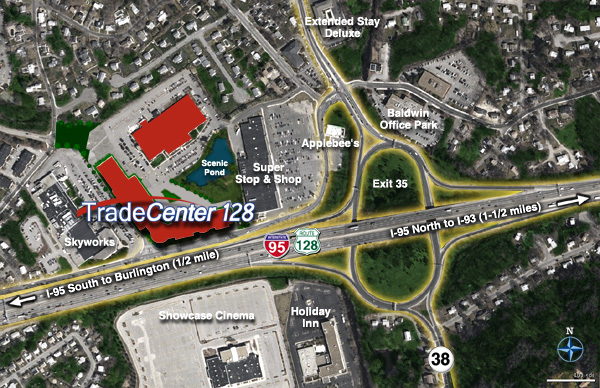 More than 550 feet of unprecedented sign frontage available on Route 128/I-95 in Woburn. Superb access to Interstate Routes I-90, I-93, and I-95 (128), plus U.S. Route 1, U.S. Route 2, and U.S. Route 3. Direct easy access to Interstate 95 (128) via both Exits 34 and 35. 11 miles to downtown Boston and Logan International Airport. Three minutes from Interstate 93 and five minutes to I-93 Regional Transportation Centerhome to Logan International Airport Shuttle and MBTA Commuter Rail. Direct on-site stop for MBTA bus route #134 to Winchester commuter rail and Wellington "T" Station (Orange Line).